Nowadays everything seems to be changing with the invention of Digital tools and methodologies. 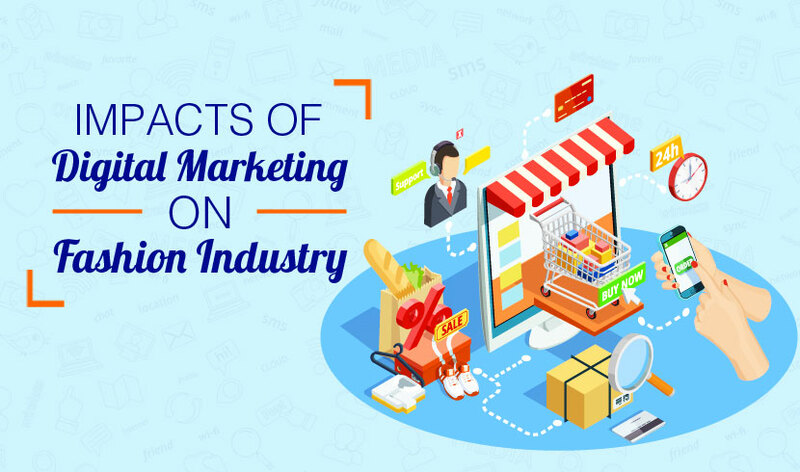 The fashion industry is also impacted by the introduction of Digital Marketing because of the role of visual content and fast-changing methodologies that are impacting day by day. People are updated with recent fashion trend with the introduction of digital marketing in the fashion industry. Today, leading fashion business is deriving a lot of revenue from digital marketing tools. So here are some digital marketing tactics being used in the fashion industry. personalized emails are one of the best ways of attracting your potential customers. Emails with personalized subject lines are likely to open them by 30%. An ideal step would be personalizing messages to the body of the email. Blogging is a great way to keep people updated about the recent fashion trends. Topics about the recent fashion trends and the latest designer brand play a key role in influencing the people. Additionally, if you share or promote these blogs on social media you have a great chance of reaching more people who are interested in your products. Especially in the fashion industry blogs play a key role in influencing the buying decision of the people. influencer marketing is one of the best ways of driving a brand into a larger market. It basically involves people with a huge fan following. This style is highly applicable to the fashion industry. Customers get a glimpse of their influencers lifestyle with those influencers using who materialize brands and products into their posts and stories. Strategic partnerships can play a key role in promoting brand equity. if you are promoting your products in an event, invite people in your event through social media. You can even give the ad of your event through paid promotion on Facebook. For example, big fashion brands utilize the very famous event of Milan fashion week by inviting their key customers to increase their brand public image through social media events promotions. Events promotion play a key role in determining the brands' value. Big fashion brands utilize this opportunity to attract their customers to buy using coupon codes and vouchers in their advertisements. It plays a key role in impacting the sale of the products. Today all the fashion brands promote their catalog offerings on Facebook, Twitter, Google Search & Shopping campaigns to maximize their sale figures. Shopaholics are very much active on social media platforms especially on facebook, twitter, and Instagram. Social media plays a big eye opener role in updating people with recent fashion trends. Social media is a platform where most of the brands compete by showcasing their latest fashion/designs. Brands are showing the new product launches with their recent trends on respective social media pages through various creative posts. Adwords campaign such as search, display, video and product listing ads play a key role in reaching to the right target customers. Fashion brands also make use of dynamic ads to represent their products to the people. Fashion companies are also leveraging the power of retargeting to show ads to those people who constantly visit their website. Companies are generating plenty of revenue through remarketing google ads campaigns. As everyone knows that Facebook is a mother of all social networking platforms. In Facebook, you can get leads at a lower cost by advertising their products with highly creative images. Through Facebook ,you can do remarketing of your products in the most efficient ways to retain your existing customers who frequently visit your website by constantly showing your ads to them. Recently launched facebook marketplace is one of the best platforms to showcase fashion products. Proper on page SEO should be done to improve the visibility of the website. Good content should be a must if you want a good website SEO. Good content plays a key role in lifting the ranking of the website. So that potential people can reach them who are searching for the relevant products. With the introduction of new digital marketing channels, the fashion industry has seen a big revolution because of which, people are getting more updated with the recent fashion. With access to all the things on smartphones and mobile devices, people can find nearby stores where they can find their useful products. With advertisements on Facebook and Google ads, people can get anything at their desired prices. People now are very well versed with new fashion clothing trends & designs a lot through social media and influencer marketing.